The recipes of success are various, but making an effort is one of those indispensable ingredients which can open new horizons for you. No high peaks have been reached without an extra effort. Keep on reading these inspirational quotes and sayings about the effort and hard work to know what else you can do to be more successful. Any results directly depend on the amount of effort you give. If you want to find out more about the connection between effort and results, read these simple quotations. Confidence is not something that comes out of nowhere. It is the result of months and years of practice, constant work, effort, and determination. The amount of effort you put in is the amount of results you end up with. Anyone can post inspirational quotes on social media. Anyone can read another motivational article. It takes effort to actual start something and follow through all the way. If you put in the time plus effort, you will see the results. Even if you aren’t full of enthusiasm about an upcoming project or you are simply exhausted, remember that you always have to be ready to go the extra mile. It takes effort and belief to persevere and stay dedicated to accomplish your goal. When you find yourself doubting whether the effort is worth it, visualize how you will feel and what you will have once your goal is completed. 5 percent extra effort makes a 100 percent difference. Sportsmen know more about the importance of pushing themselves to the limits than anybody else. Why not listen to their pieces of advice? Success in anything will always come down to this: Focus & Effort, and we control both of them. If you put forth the effort, good things will be bestowed upon you. Everyone knows that the lack of effort leads to poor results, no matter if it’s business or relationship. Check out these life-changing quotes explaining that you don’t need to expect great things while doing nothing. The bitter and the sweet come from the outside, the hard from within, from one’s own efforts. Effort is the extension of the will; without a will, without determination, there can be no effort. Ecstasy is our very nature; not to be ecstatic is simply unnecessary. To be ecstatic is natural, spontaneous. It needs no effort to be ecstatic, it needs great effort to be miserable. That’s why people look so tired, because misery is really hard work; to maintain it is really difficult, because they are doing something against nature. If you put in little effort and expect big returns, you will be deeply disappointed. You don’t get apples by planting lemon seeds. If you can do a half-assed job of anything, you’re a one-eyed man in the kingdom of the blind. Those of you, who are wondering if it is worth to put in the greater effort when it comes to love, leave your doubts behind. These quotes about effort and love will explain why. Exerting all your efforts on one thing is the most important thing that you have to learn to be. If I put forth a legitimate effort, then I feel like, if that doesn’t work out, that’s all I can do. To build a mighty tower, you must bet all of your effort and potential to it. Focusing your efforts on the people who are interested in you, and get along with you, makes life so much easier. There’s no such thing as putting extra effort in on one day than the other. Every single day is a lot of effort, usually maximum effort every day. If you know how much work effort is required for a certain task, but have a hard time making an effort, don’t miss these encouraging quotes. You won’t fail unless you have made the effort to try. It is far better than doing nothing at all. It is still a failure when you remain stagnant. As often as you fail, get up and try again. God will never let you down, so long as you don’t let Him down, and so long as you make the effort. Attitude is 80 percent, skill and effort are 20 percent. Have you ever found yourself in a tricky situation when you are the only one putting in a massive effort and all you get in return is nothing? Well, you are not alone with this problem. Find the answers to your questions in these profound quotes. Don’t chase. Know your worth and know that you deserve to at least be met half way. 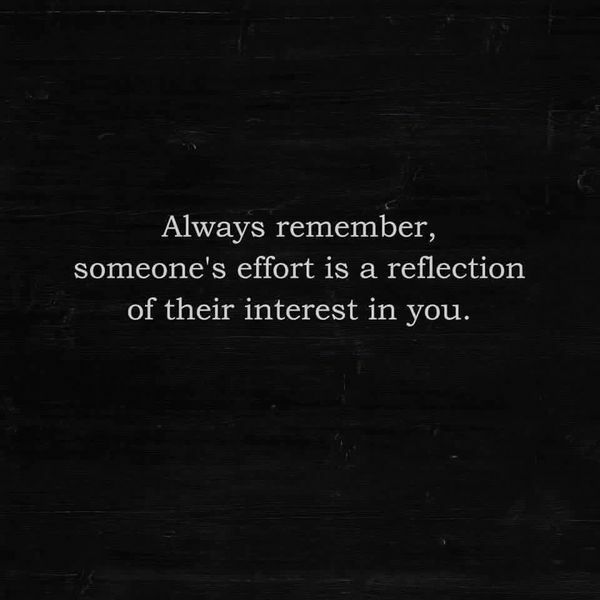 If they don’t match your effort, they don’t want to be in your life. If people don’t put effort into your relationship, then you don’t need to bend over backwards to make them stay. No matter how much effort you put in, some people just won’t appreciate it. You can put all your effort in trying to make someone happy… but there comes a time when we become tired of trying to fill a bucket that is leaking from the inside. I’ve figured out that life in general is a team effort; it’s a team game. Relationships require consistent effort from both partners. Take a look at what other people say about how important it is to try hard in a relationship. When someone really cares about you, they make an effort, not an excuse. The wings of a phoenix will take you only so far, it is up to you to jump from his back and land on your own two feet. I think all a girl really wants from a guy is his effort to show her just how much he cares & how much he loves her. Always keep in mind that any effort pays off. We hope that these sayings about effort will provide you with enough inspiration to do your best at work. A little more persistence a little more effort, and what seemed hopeless failure may turn into a glorious success. The best sort of character, however, cannot be formed without effort. There needs the exercise of constant self-watchfulness, self-discipline, and self-control. Let the dragon in your soul be the keeper of your dreams — and breathe fire on all those who dare to tread, including your own demons and laziness. Success is a matter of individual effort only to the extent that each person must decide, in his or her own mind, what is wanted. I may not be the strongest I may not be the fastest but I’ll be damned if I’m not trying my hardest. When it comes to great results, giving your 100 percent is essential. Here’s when the experience of famous and successful people can really come in handy. The man who succeeds is a man who has withstood the tests of time, trials, and has made every effort count. Mental toughness with extreme effort is the formula for success. Failure is the hallmark of success it can be the starting point of new venture, such as when a baby learns to walk; it has to fall down a lot to learn the new skill. Each failure becomes a starting point for the next effort proving that failure is not failure. You’re either changing your life or you’re not. No waiting for this or that or better weather or other hurdles. Hurdles are the change. It still takes a serious commitment and honest effort for your goals to come to fruition.